In case of custom page such as showing products in Blog, FAQ or any custom pages. You just need to add the following snippet to the page. Mageplaza Quick View will be compatible and show Quick View button. You can add it on one page or one block by going to Content > Elements > Pages / Blocks . Also, you can insert it into .phtml, .xml files of Magento as well as other extensions that you want to display the popup. .phtml or .xml file type. In this case, you can insert to any page via Widget in Backend, you don’t need to edit any line of code. 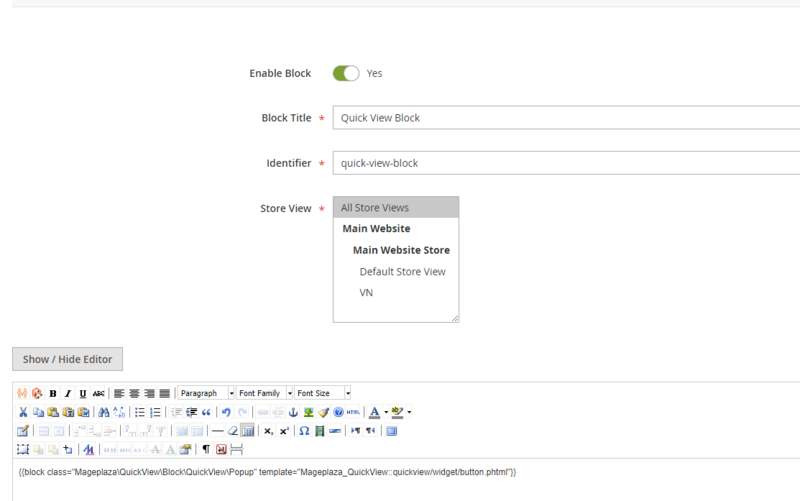 Now insert a Widget to specificed pages with above Block Content. Design Theme: Select your current theme. If you are using Porto Theme, then select Porto Theme, in this case, I select Magento Luma. Go to Widget Options tab, Select Block Find Mageplaza Quick View > Save and Continue Edit this widget. Now flush cache and check your result.